With Thursday complete, it’s time to move on to the quarterfinals. Richmond, George Washington, UMass, and Davidson all picked up wins to keep themselves alive in the A-10 tournament. Friday will feature four games all televised on NBC Sports Network. Lets take a look at the evening games which will feature some great match-ups. After beating Rhode Island on Thursday night, UMass will take on VCU in an A-10 quarterfinal showdown. 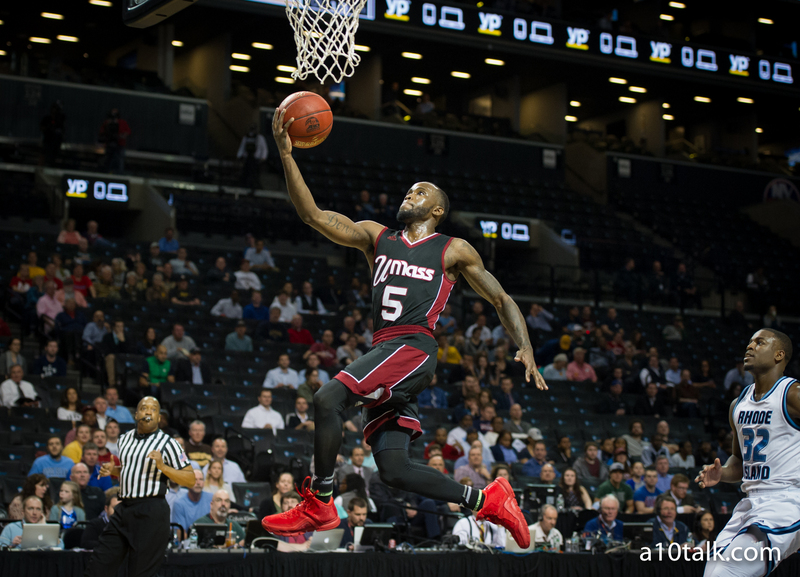 The Rams and Minutemen met once during the regular season, with UMass picking up a 69-63 win. Despite four Rams scoring in double figures, strong performances by Donte Clark, Trey Davis, and Jabarie Hinds powered UMass to a win. Now, as Co-sharers of the A-10 regular season title, VCU will look to gain sweet revenge. The Rams come into the game with a 22-9 record and could use this win to help solidify its NCAA tournament hopes. As for the Minutemen, they must win in order to keep their season alive. Make sure to tune in to NBCSN at 6:30. You won’t want to miss this epic battle. Grant’s Take: While UMass will come out and give everything they have, I’m not sure it’s enough to beat VCU. The Rams will play with a little extra motivation in this one. VCU not only wants revenge, they want to repeat as A-10 tournament champs. While I like VCU to win, if the Minutemen can assert themselves similar to last time, anything can happen. Davis, Clark, and Hinds always have the capability to light it up. Davidson closed out upset-minded La Salle Thursday night to earn a date in the quarterfinals with the St. Bonaventure Bonnies. After earning a share of the A-10 regular season title, St. Bonaventure grabbed the tournament’s #3 seed. The Bonnie’s come into today’s game on an absolute tear. They have won nine of their last ten and currently ride a five game win streak. As of now, Davidson finds itself on a two game win streak and will look to make it three on Friday night. The only time these two teams met during the regular season came way back on January 2nd. Jaylen Adams scored 30 points to lead St. Bonaventure to a 97-85 win. With the immense offensive firepower on both these teams, expect another high-scoring shootout. Whoever comes out of this 9:00 matchup victorious will secure a spot in the semifinals on Saturday. Grant’s Take: This game promises to be a ton of fun to watch! A guard battle like Gibbs vs. Adams certainly will not disappoint. The Bonnies have been rolling lately and I don’t think Davidson has quite enough to overthrow them. As a team on the bubble, St. Bonaventure needs this win to help impress the selection committee. If Peyton Aldridge can get things going like he did against La Salle, however, the Wildcats might pull off the upset. Either way, this one promises to entertain and should go down to the wire.